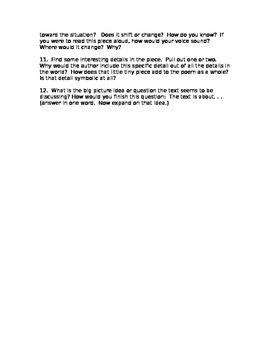 When asked to annotate a poem, a small prose piece or any document, students are often baffled as to where to begin. 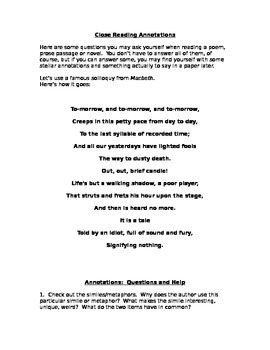 This lesson takes the most famous soliloquy of Macbeth for an example and has students close-read for twelve key literary devices. Each device is broken down into smaller questions, and when students have completed the entire lesson, they will be amazed at how much they have to annotate, and thus analyze. Students will be able to take their work and write under-the-surface, deep analysis for this piece. 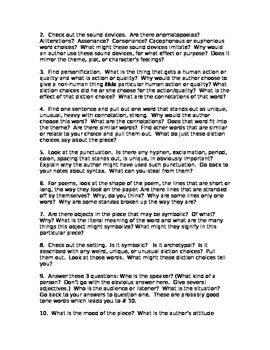 Better yet, they will be able to take the 12 questions and apply them to any poem or text for a deeper reading.